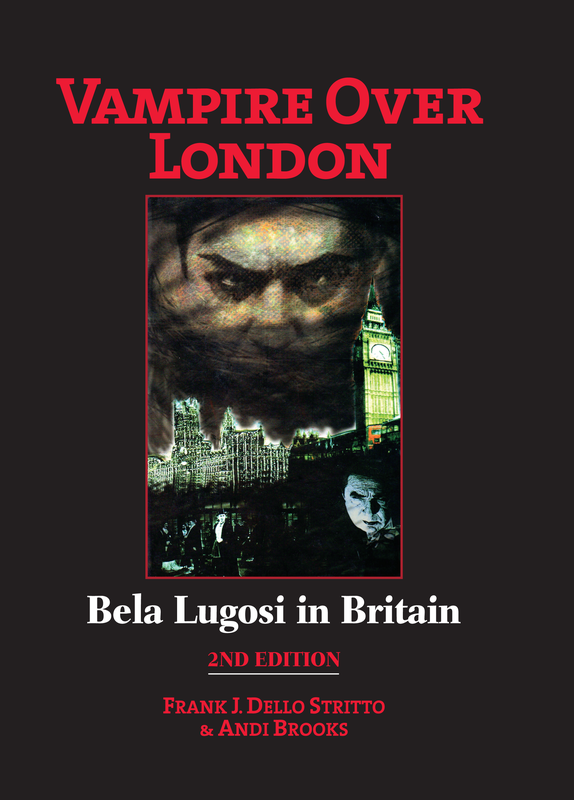 Originally published in 2000, an expanded and revised 2nd edition of the critically acclaimed Vampire Over London: Bela Lugosi in Britain by Frank J. Dello Stritto and Andi Brooks was published this July by Cult Movies Press. Taking an in-depth look at Lugosi’s 1951 British stage tour of Dracula and the three films he made in Britain, Mystery of the Mary Celeste (1935), Dark Eyes of London (1939) and Mother Riley Meets The Vampire (1951), the new edition contains not only newly discovered information and images, but also additional first-hand accounts from people who worked with and saw Bela Lugosi as he toured across Britain. One of the most fascinating newly-added accounts comes from Joyce Wilson, the widow of Ralph Wilson, the Dracula stage tour’s 2nd Van Helsing. Joyce traveled with her husband on the tour and was able to gain a unique insight into the production. The following extract from the book is based on Joyce’s recollection of her husband taking over the role of Van Helsing from the tour’s original vampire hunter, Arthur Hosking. 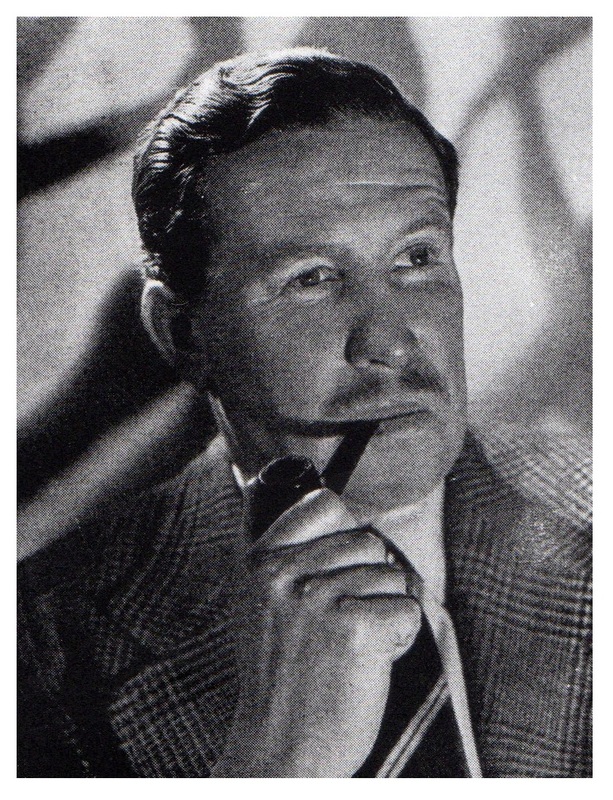 About the same moment that Arthur Hosking told Alfred Beale that he would leave the tour in a week, character actor Ralph Wilson attended the polo matches in Roehampton (a suburb southwest of London) with his wife Joyce and her sister, as well as their vicar and his wife. After the match, as the Wilsons walked down the street to their flat, they heard the phone continuously ringing until they could reach it. Wilson’s agent, Dorothy Jane Ward, asked if he could go to Leicester the next day to take over Van Helsing as soon as possible. Could he meet with the manager and stage director, Sunday night in Leicester? He reported as asked, and saw the script for the first time. Only in Leicester did he appreciate the size of the role that he had just accepted, and the amount of dialogue to learn. On Monday morning Ralph called Joyce. He needed her to help him prepare. His World War II combat service had left him hard of hearing, and he could not easily rely on spoken queues or prompters during a performance. The outgoing Wilson mingled with the company in his free time, quite the opposite of Hosking. Onstage and off, Wilson was the new energy the play needed. As a career soldier, he had an immediate rapport with the reserved Sheila, daughter of a Colonel. As a lover of art and culture, Wilson took to the aloof David Dawson. Except for two weeks to have her tonsils removed, Joyce would be with Ralph husband for the weeks on the road to come. Both were good mixers, and soon had good friends among the company. The Wilsons already knew Eric Lindsay, and became close to John Saunders. Another surprise for Wilson in the script handed him in Leicester was how small Dracula’s role is compared to Van Helsing’s. How would a world famous star in that smaller part—who would also be directing the rehearsals—take to the newcomer? By mid-week in Leicester, Wilson was ready for rehearsals, conducted in the afternoons before the evening performances that still featured Hosking. Ralph and Joyce arrived early. Stage director Tommy Muschamp confronted them. He did not want Joyce in the theatre. He did not want anyone not involved in the rehearsal present. Ralph tried to explain that he really needed her with him. Before the back-&-forth went too far, Bela entered. He introduced himself with a flourish, and took Joyce by the arm. “You must come and sit with me for all the rehearsal,” said Bela as he guided her to the third row center, “and then you will be better able to help your husband to study the part.” Muschamp bit his lip, turned, and went backstage. Bela soon realized Arthur Hosking and Ralph Wilson were as different on stage as off, and made many changes to production to suit the new personality. The Wilsons thought Bela’s reshaping the play very effective. Neither director nor star could hear very well. When Bela called out directions, the other actors had to repeat to Ralph what Bela had said. 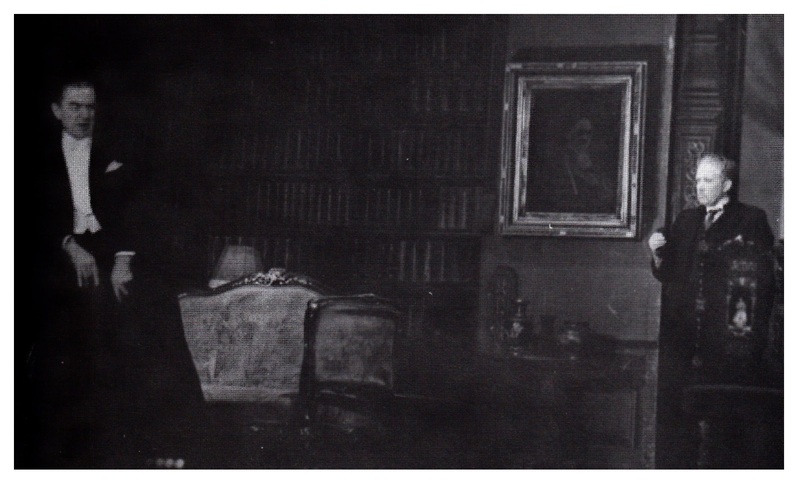 Ralph would reply, and Joyce repeated his words to Bela—perhaps explaining why Bela insisted that Joyce sit with him. This is your scene, Ralph. The spot will be on you and I will move back into the shadows so that all the attention is focussed on you! Such generosity from a star particularly impressed Joyce. Ralph Wilson made his debut as Van Helsing at the Saturday matinee performance at the Palace Theatre in Leicester on August 4th, 1951. I spent a lot of time in Bela’s dressing room with Lillian during the show. We would have liked to go out together to a film, or perhaps for a drink, but Bela was obsessively possessive of Lillian and could not bear her to be out of the theatre during the show. Lillian, as well as Bela, talked incessantly of their son, whom they had not seen in so many months. 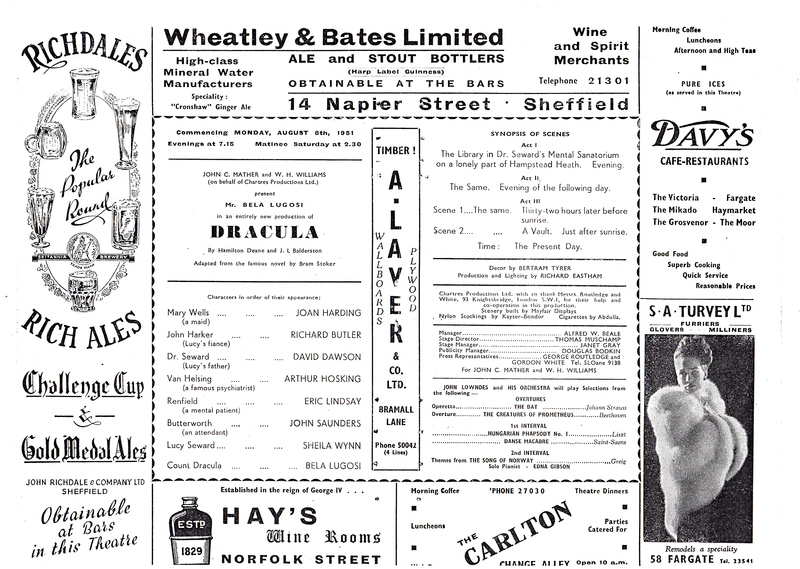 Printed in advance, the programme for Ralph Wilson’s first full week as Van Helsing at the Lyceum Theatre in Sheffield listed his predecessor, Arthur Hosking, in the role. Wilson first played Van Helsing at the Leicester Saturday matinee (August 4). No back stage staff was available as prompter, and Wilson felt adrift. Again to Muschamp’s fury, Bela insisted that Joyce do the job. Bela fortified Ralph, as he had Alfred Beale three months before, with few Benzedrine tablets. Ralph finished the performance with only one prompt, provided by Joyce through the fireplace. Today, 60 years after his death, horror movie star Bela Lugosi remains a Hollywood legend. This ground-breaking book uncovers the untold tale of his 1951 Dracula stage tour across Britain. That tour, like the three films Lugosi made in Britain in 1935, 1939 and 1951, is often overlooked in his life’s story. This book tells the full story at last, and adds to a legacy unmatched in Hollywood history. The tale of 1951 also delves in the anything-goes world of post World War II British music halls and theatre. 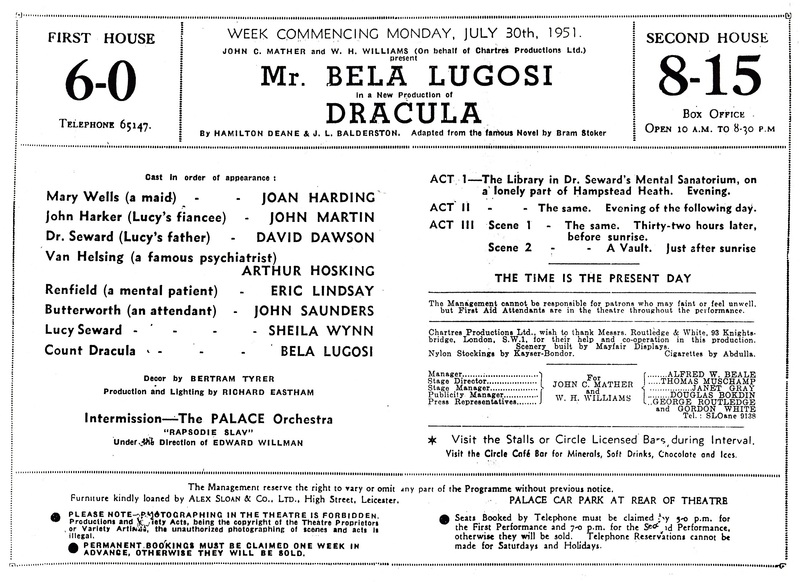 The rich history of British stage, combined with Lugosi’s unique career and persona, makes a compelling history. 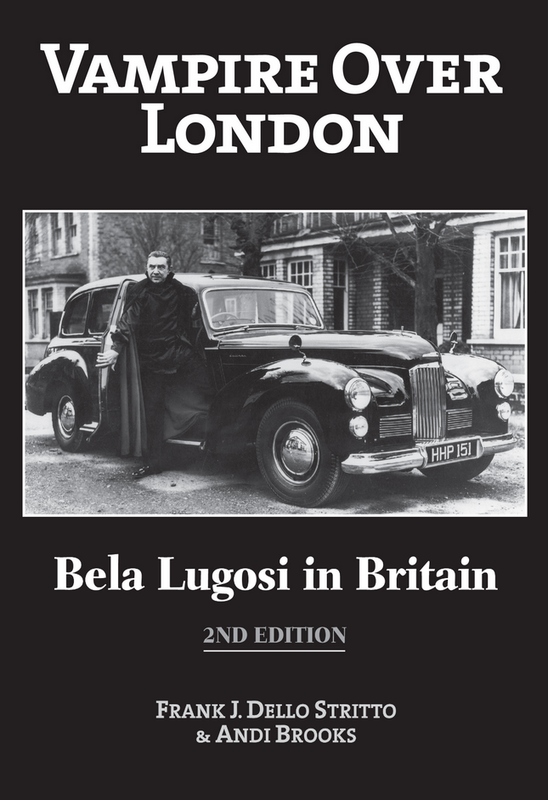 Originally published in 2000, the critically acclaimed biography of Bela Lugosi was the product of over a decade of extensive research by the authors and was the first book to study a particular, and neglected, period of Bela Lugosi’s life and work. Vampire Bats And Devil Girls From Mars: Dracula Producer John Chartres Mather Interviewed By Frank J. Dello Stritto.